Derek Thompson is 'The Tooth Fairy,' a hard-charging minor league hockey player whose nickname comes from his habit of separating opposing players from their bicuspids. 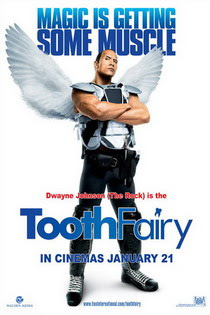 When Derek discourages a youngster's hopes, he's sentenced to one week's hard labor as a real tooth fairy, complete with the requisite tutu, wings and magic wand. At first, Derek "can't handle the tooth" – bumbling and stumbling as he tries to furtively wing his way through strangers' homes…doing what tooth fairies do. But as Derek slowly adapts to his new position, he begins to rediscover his own forgotten dreams.